I really thought that I would be able to get through these early months with Alder without blogging about his sleep because frankly the first 4.5 months were pretty amazing. I don’t know why it is but I only want to blog about sleep when we are going through a tough time but here we are. I tell you I am actually really surprised because from the moment Alder joined us Earth side he was a great sleeper. I mean he was up a few times at night to nurse but I would nurse and he would go back in his co-sleeper and just sleep. When it came to nap time he would just fall asleep on the couch or in his bouncy chair without me having to nurse him. There were actually a few times where I got myself already to nurse him because I knew he was tired and I look over and he is fast asleep. These days that’s just not the case. During the day I used to put him down for his first nap upstairs. I’d lay down and nurse him to sleep and then get up and leave him on the bed. During his second nap I would nurse him downstairs because as many of you know we all share a room so during his second nap it is Edith’s nap time so he sleeps downstairs. Anyways I would nurse him to sleep and then he would either sleep next to me on the couch, in the bassinet or in the bouncy chair. These days I go through the same routine for morning nap but he doesn’t want me to leave. He will either wake up right when I start to get off the bed or he will wake up within 15 minutes of me leaving- which means the morning nap just isn’t really happening. 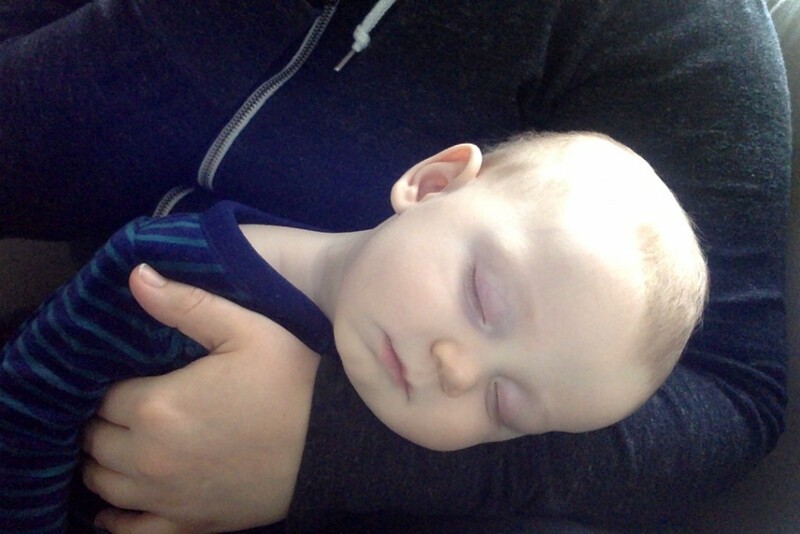 As for the second nap he won’t let me put him down. I end up spending Edith’s entire nap with him in my arms and don’t get me wrong I love the snuggles but I also use nap time to get work things done and things around the house which means neither are happening right now. As for evenings Alder usually stays downstairs with us while Edith goes to bed and again the problem is he has to sleep on one of us. Neil and I have actually taken to alternating “hands free” nights so that we can each have a chance to get things done in the evening. We have tried putting him down and he wakes right up and I have tired going upstairs with him and nursing him to sleep in bed but just like at nap time he wakes when I try to leave or within 15 minutes of me being gone. Last night was terrible. I only slept from 3:30-7 and even that was interrupted by a nursing session. I tell you I’m exhausted and we are all out of coffee. I feel like we were here once before with Edith and I remember feeling exhausted but back then things were different. We only had one child to think about. With two and our sleeping arrangement (which won’t change right now because despite my complaining we love it) it makes it challenging to figure out this whole sleeping thing. Okay venting done. Now any words of wisdom? Man, I feel your pain. We have the same problem in the day so A is literally on me in a wrap for every sleep from 9am til 11pm. And she cluster feeds all evening. It’s tough isn’t it. Sorry I have no words of wisdom. Theo was the same but outgrew it by 6 months. I’m hoping the same will happen. Right now, I’m so tired of constant childcare that I want to go back to work! Terrible, isn’t it.